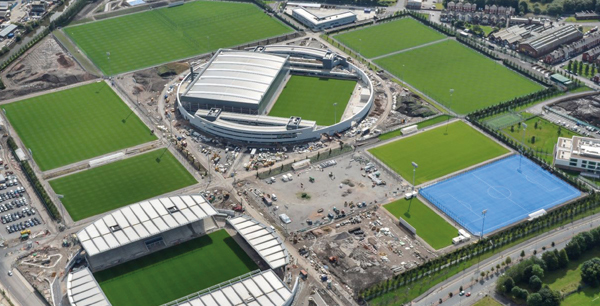 Designed by Rafael Vinoly Architects, the football academy is home to 450 players training each week and features a 7,000 capacity stadium, a team building with changing rooms, a gym, a refectory and injury and rehab centre, staff offices, media centre, on site accommodation and 16.5 football pitches. Ensuring this impressive new facility will stand the test of the time, groundworks contractor Murraywood Construction specified the Hepworth SuperSleve clay drainage system for the building facilities to guarantee chemical resistance, longevity, strength and a trouble free future. Available in 100mm, 150mm, 225mm and 300mm diameters and used in commercial or industrial construction, adoptable sewers, highways and general building works, the Hepworth SuperSleve system consists of plain ended pipe and fittings with additional push fit flexible couplings. Peter Mason of Murraywood Construction, said: “With the team’s training facilities built on polluted ground, it was vitally important that clay drainage was specified due to the risk of chemicals. Paul Wydell, Product Manager at Hepworth, said: “Clay drainage pipes also allow specifiers to reduce installation costs as well as environmental impact by minimising the volume of primary aggregate needed from quarries. Clay pipes have tremendous compressive strength which allows their installation with reduced amounts of granular bed and surround, recycled material or even reused as-dug material if suitable.